CRAZY DISCOUNT! Was: $109.95 Now: $89.96! Let this multi-functional shoe bench keep your shoes neatly in place. With soft cushion, this bench offers you a comfortable seat where you can sit, avoiding the hassles of moving another chair when changing shoes. This shoe cabinet can accommodate up to 15 pairs of shoes, adequate enough to store your slippers, sandals, sneakers, boots, heels, etc. Designed to separate shoes from open air, this shoe cupboard prevents every pair of shoes from being covered in dust. Made of solid wood, this shoe organizer is durable and sturdy. With walnut melamine finish, this modern and elegant wooden shoe cabinet can blend perfectly with your home décor. On its top, you can put a classic pillow to lend a stylish touch to your home. Perfect for entryway, bedroom or living room. 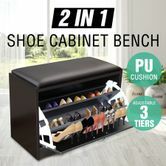 Purchase this shoe cabinet to keep your shoes well preserved with ease from now on. 63cm x 30cm x45cm approx. 71cm x 45cm x 17cm approx. Received quickly in good condition. Holds 8 pairs of teenagers shoes.